With the interest people have had in the Ao Shun since the PopSci article came out, I figured I should put together some stuff on here for people to look at. Designation: Ao Shun Deep-space research vehicle. Main Hull: 275 meters (contains engine, reactor, fuel, etc). Bussard Collector: 750 meter long, spiral field extender array. The hydrogen collector is a 750-meter-long structure made up of electromagnets that extend a magnetic funnel about 10 kilometers out ahead of the ship. 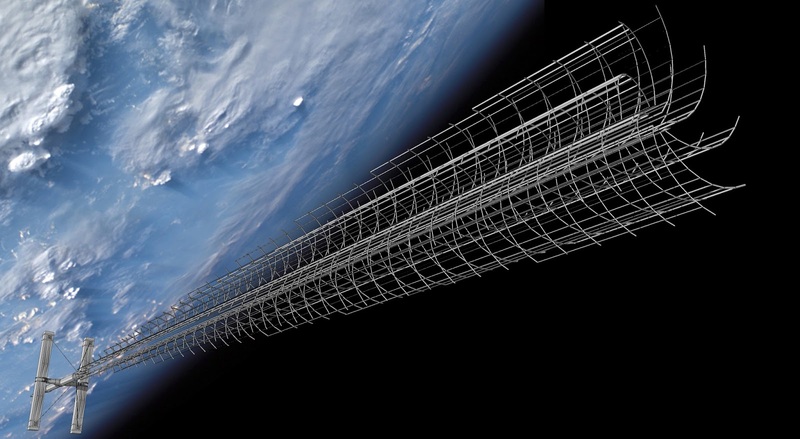 This invisible “funnel” gathers free-floating hydrogen from deep space and shunts it straight into the engine. It’s constructed of a carbon fiber/carbon nanotube/titanium mesh. It needs significant amounts of titanium in order to sustain the compression force exerted on it by the fusion rocket during the acceleration cycles. Fueled by Bussard hydrogen collector. First stage ionizes the hydrogen, second stage pre-accelerates the particles, and the final stage initiates a fusion reaction to further energize the particles as they exit out of the back of the ship. Engine also has a “reverse gear” for use during deceleration, which uses a magnetic sling-shot to send the pre-accelerated particles back up to the front of the ship, where a second fusion reaction chamber and exhaust are located. Sensor package at the front of the Bussard Collector which also has high-powered lasers and particle cannons to either vaporize or redirect incoming debris that may threaten to damage the ship. During acceleration, the ship is cross-shaped, with the modules close to the center hull to minimize stress on supports. The floors of the modules face the same side as the engine exhaust. The acceleration force of the engines provides force on the floor that exactly imitates the feeling of gravity. To shorten the trip, the ship could possibly be set to higher acceleration rates during sleeping periods. 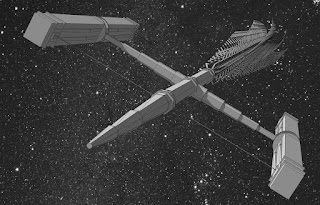 During cruising or orbit periods, the ship rearranges to compensate for microgravity. 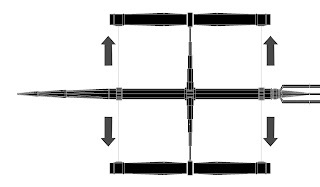 First, the modules rotate around where they attach to the connecting corridors, transitioning from being perpendicular to the main hull to being parallel to it. Next, the modules rotate along the axis of the length of the ship, turning the floors outward, away from the center hull. Next, the modules extend away from the center hull, the connecting corridors extending like accordions. This lowers the necessary speed of rotation as well as the force differentials between the floors and the ceilings of the modules (both of these help minimize motion sickness from the spinning). Finally, the modules spin around the center hull. During the first half of a journey, the ship will spend the entire time accelerating. After hitting the half-way point, the engine reverse-thrusts to decelerate during the second half of the journey. Ship accelerates constantly at approximately 1 g (10 meters per second per second) for the first half until reaching 80% of the speed of light (which takes about 11 months). Then the ship would cruise until nearing the destination and then decelerate at the same rate. The Ao Shun Won 1st Place! I never heard back after I submitted, so I actually thought they'd rejected my submission because it was too far-fetched. Then I completely forgot about it...until I got a mysterious email saying I won first place in something.